I entered a contest a while back on the Babyccino Kids blog (Eurostyle design news for your bundle of joy) and won this lovely Ricochet bracelet from Arabelle Fine Jewellery. Note the spelling, which demarcates the fanciness of their collections… Roo loves jewelry. I do, too, but I tend toward funkier styles and handmade items while she prefers more classic bling. I figure it must just skip a generation, since her grandma is an opulent jewelry nut, too. Arabelle Children's Collection is sweet but sophisticated, a scaled-down version of the gorgeous pieces they offer for adults. 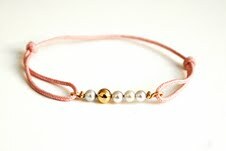 I especially love the simplicity of the sliding pearl and gold beads mounted on an adjustable silken cord. No fussy clasps or extraneous doo-dads to fiddle with or get caught on clothes. I also love the classic black box with printed ribbon, such an elegant presentation. The bracelet comes wrapped around a tiny cushion made of what looks like vintage kimono fabric, giving it a subtle bohemian flair. Love it. So pretty! I can see Roo enjoying the wearing of that.